Tender pieces of steak, beef kidney (minced) and rich gravy, in a light puff pastry case. Dig into the deliciously rich gravy to discover tender pieces of carefully selected steak, brilliantly balanced with minced beef kidney. It's all wrapped up cosy for you in a light crispy puff pastry case. 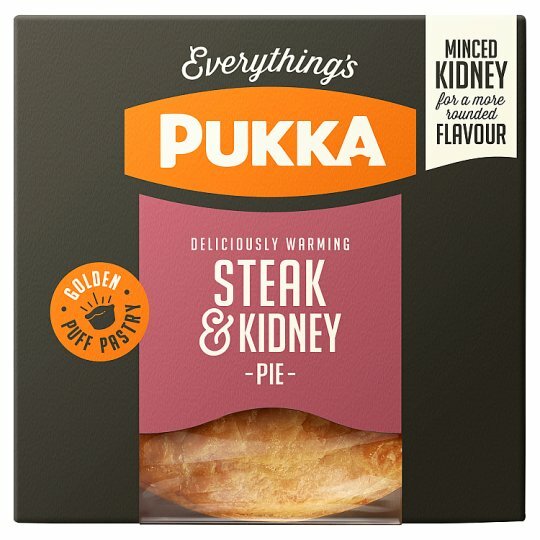 Please note we finely mince the kidney for even distribution of flavour. Keep refrigerated., Suitable for home freezing: freeze on day of purchase, referring to freezer manufacturer's handbook. Consume within one month. Do not refreeze after thawing., Use by date: see front of box. Cooking Instructions (General): Remove outer packaging but leave pie in foil container & place on a baking tray. There are only guidelines as appliances may vary. Oven cook (From Frozen): In a pre-heated fan assisted / gas oven: Heat for 50 minutes at 180°C/gas mark 6. Oven cook (From Chilled): In a pre-heated fan assisted/gas oven: Heat for 25-30 minutes at 190°C/gas mark 6 1/2.